Join me in my adventures in this crazy little thing called life! Welcome Spring! Come on in and stay a while! 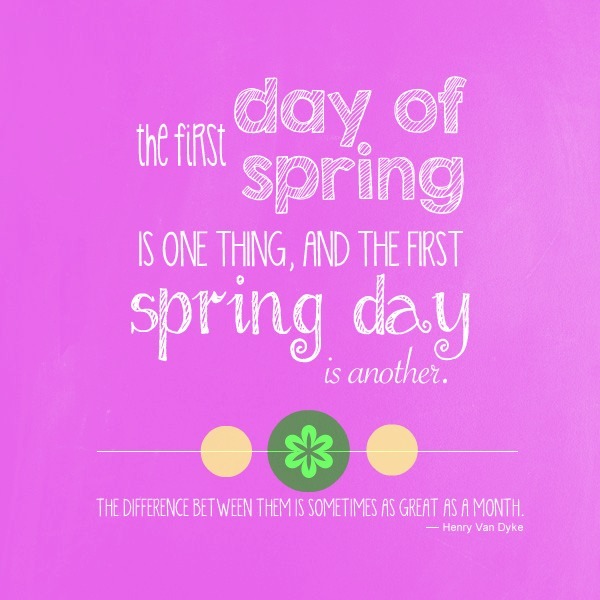 I am SO excited that today is the OFFICIAL first day of spring! It is one of my favorite seasons of the year! Especially since I hate the cold, it is such a nice welcome change to finally have warm weather all the time again! 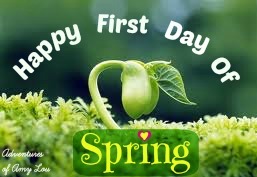 Unfortunately just because it is the “first day of spring” doesn’t mean that it is our “first spring day”! OR that it will continue to be spring from here on out! Our weather here in southern Missouri is a beautiful, sunny, mid 60’s! The PERFECT weather for the first day of spring! However they are calling for some light snow possibly on Saturday… uggh! I’m just ready for spring to be here to stay! 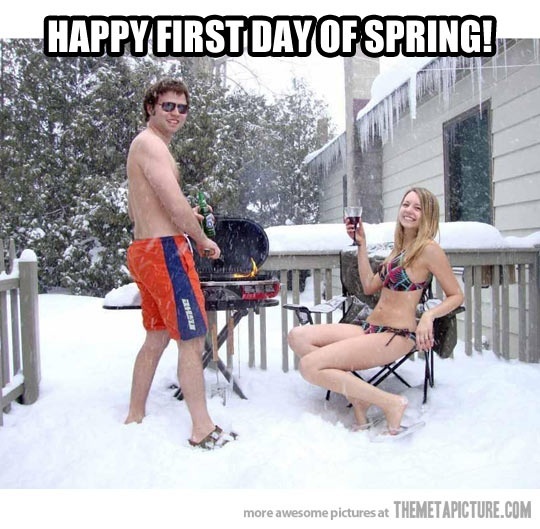 Any of you out there having a cold and nasty first day of spring? Maybe like this one pictured below? Lol! I am SO glad that’s not what it looks like outside of my house right now! I have plans to take my daughter to the park this afternoon after her nap! We are going to meet a friend of mine and her two sons and we are going to fully enjoy the wonderful weather now that it is here! 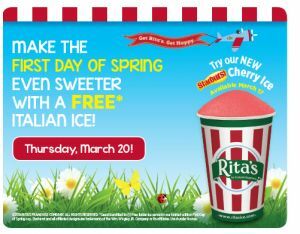 By the way I found a post from Money Saving Mom letting everyone know that you can get a free italian ice today, for the first day of spring, from noon-9pm at Rita’s Ice! If we had one here I would totally be going to get one to enjoy while we are at the park! Maybe I will have to swing by Sonic’s Happy Hour for a half price real fruit slush! If you would like to check if you have a Rita’s near you here is the link to their site for locations and other offers you may be interested in! Well, that’s it for now! I am going to shut off this computer and spend my day enjoying the beautiful sunshine and my sweet daughter! Plus a few craft projects while she naps probably! 😉 I hope everyone has a gorgeous day today also! Happy Spring! 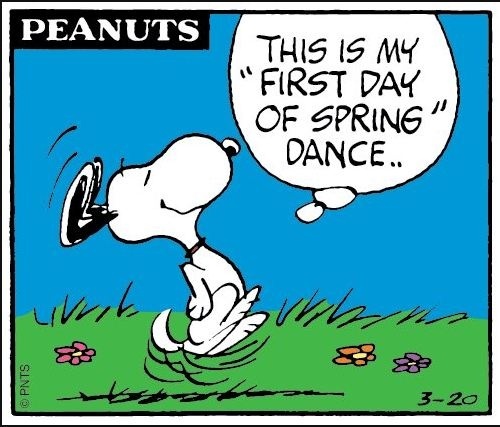 This is exactly how I feel today too Snoopy! I hope you all enjoy also! Follow Amy Lou by Email! Would you like to follow this blog and receive notifications of new posts by email? Enter your email address! trsblogstaff on Busy, Busy, Crafting! Follow our daily photos on Instagram!